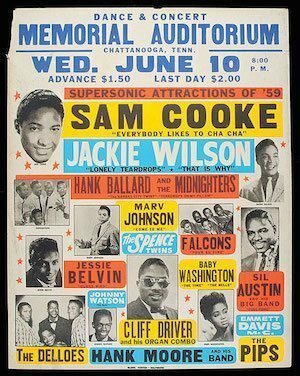 The late and truly great Sam Cooke was born in Clarksdale, Mississippi on 22 January, 1931. Imagining this great vocal stylist as a senior citizen is especially poignant when you remember that he was a mere 33 when he was shot to death in a motel in December, 1964. His passing was insalubrious, but in just a few short years of success, his songs and his unmatched singing technique had already influenced many of the upcoming generation of stars. Sam’s good looks and innate style made him a real hearththrob, but let’s not forget that he was also one of the first African-American musicians with a true grasp of the music business and how it worked. He would form his own record label and publishing company, almost unheard of for a black artist at the time. For many, Cooke basically invented soul music, but he could never have brought such inspired interpretation to his songbook if he had not come from a gospel background. His recordings with the Soul Stirrers are stirring indeed, and even if there were those who opposed his supposed “abandoning” of his church roots to sing pop music, the world would have been a much poorer place had Sam not made that progression.